January was a very busy month for me! Lots of swap blocks done, for the Scrappy? Sew Bee It! Swap. A re-purposed floor mat for my kitchen. Major progress on blocks for the Test Your Skills Sampler. A quilt top sandwiched and pinned, ready for quilting – and I even inadvertently named it. A couple of blocks for the Farmer’s Wife Sampler. Too bad the busy streak won’t continue for a while – my mother-in-law is temporarily in a nursing home, recuperating from her second full knee replacement, so I don’t have even the free Saturdays and Sunday mornings I had before 😦 I’m hoping to eke some time out over the next month, but not holding out much hope. With his schedule being disrupted by not seeing Grandma on a near-daily basis, Zeb is a little more clingy than usual. Poor kid gets totally thrown for a loop when his schedule is messed with. My plan is to purchase a sewing table, or have one built, so that I can focus on my FMQ skills. I’m sort of leaning toward purchasing the table, though it’ll be my ONE big quilting purchase for the year that I’m allowing myself. I just don’t need to invest in a lot of fabric again, and I’m honestly more interested in finishing my projects this year. 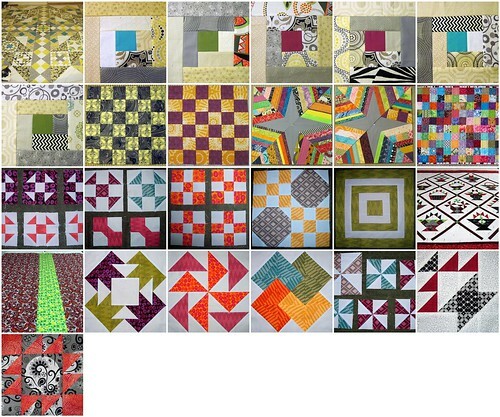 I have gained a lot of skill and accuracy since I started blogging about quilting, and I’m ready to take the step into entering some of my finishes into quilt shows. I may not win anything, but I want to get out there, to challenge myself, to push my creativity and skill. Other things to accomplish by the end of February? 1.) Design and get some quilt labels printed up via Spoonflower. Some will be specially designed labels for the quilts that I have in production. Others will just have blank spaces that I can embroider the quilt’s information, though they’ll have my ‘branding’. 2.) Design and print the color labels for my scrap buckets. 3.) Re-organize my sewing area. I now have another unit for storage, and it’s about time I use it! 4.) Get to the gym more. I’d like to go three times a week, minimum. Right now, that means I need to add Saturday mornings to my rotation, as well as ensuring that I go on Monday and Wednesday evenings after work. 5.) Train myself to wake up earlier, so that I can do some exercising before I go to work, since getting to the gym has been a challenge. Family comes first. Just use your sewing a therapy for a while. 15 minutes of it can do wonders. Ask me how I know. Family does come first. Unfortunately, I’ve never been able to accomplish much sewing in fifteen minutes segments. I find that I really only get into a groove when I have at least an hour to work on something. Wow look at you! I am really impressed! You have to post about getting labels done on Spoonflower…I really had no idea that could be done! I definitely will! I’m hoping to do the designing this weekend, and then place the order soon. I was just exhausted reading the blog! I do hope you do get an hour to yourself. I think I may be the same : I need a block of time to get into my groove and then you can’t stop me! Don’t forget to eat well while all this is going on around you. You will need all the goodness of quality to make it through, especially with the added stress of grandma being so laid up. An upset toddler tends to take everyone on the ride with them! Staying cool and calm is the plan! Grandma is heading home on Tuesday – we’d expected her to be recuperating longer. We’ll see how things go from there! Thank you! Hubby’s being super about understanding my need to commune with my sewing machine, so he managed to help me squeak some sewing time today.